If only they had posted their symbol on Topiary they would not now be disappointed, as ALL Topiary are straight-forward, upstanding members of whatever hedge or yard they happen to find themselves inhabiting. So true. 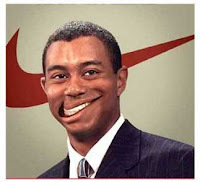 Could be Karma in action, after all, Nike has had quite a checkered past of it's own. These filthy greedy corporations do have a way of undoing themselves. I'm glad I'm poor and don't hurt anyone. You should call them and offer to be their new spokescow. They need one!!! Karen: yes a clean conscience is definitely a consolation, good thought! Watercolor: ah the ability of Topiary to sell sneakers, why, how silly of them not to think of this! i always used to confuse Nike's catchphrase with Nancy Reagan's anti substance-abuse slogan, ending up with Mrs. Reagan telling young drug addicts to "just do it". someone should have told tiger woods to "just stay no". TOPIARY FOR PRESIDENT. although seriously, who would want that job?